Exciting transitions are occurring in the Jemamobile (RV) as spring arrives. A season to rearrange totes and make space for new creations. An opportunity to float out into the world as a vulnerable being. A year of purposeful play, and childlike wonder as creativity is embraced and fears are released like bubbles in the wind. 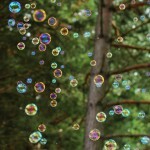 Bubbles remind me of simple wonders and childhood days playing barefoot in prickly lawns. Soapy suds oozing down my fingertips and colorful, exploding bubbles dancing on the summer breeze. Bubbles remind me of how fleeting this life really is, just moments of beauty and living, short but so very sweet. Bubbles encourage me to follow the flow of this beautiful life. 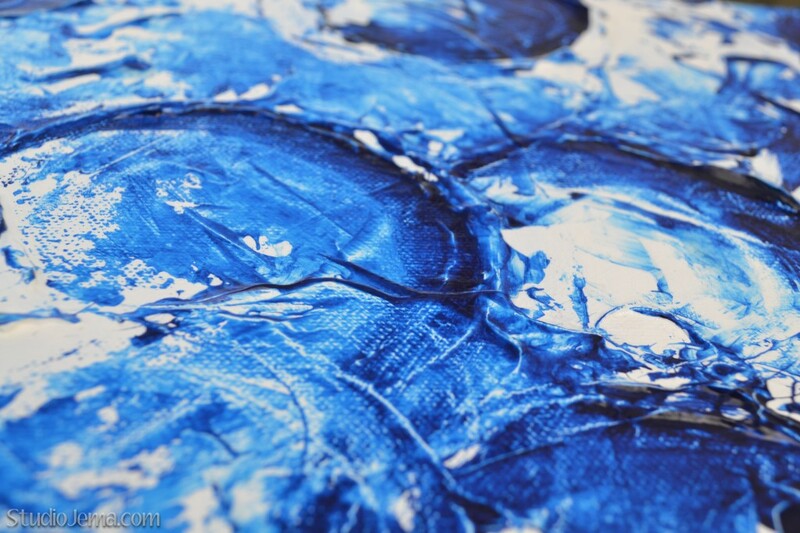 To create these bubbles on my canvas, I used Super Gel Medium and a nice round lid. I spread the gel across my canvas in a thick layer, and placed an old peanut butter lid on the gel while rotating it around, then lifted it off to create uniform circles. 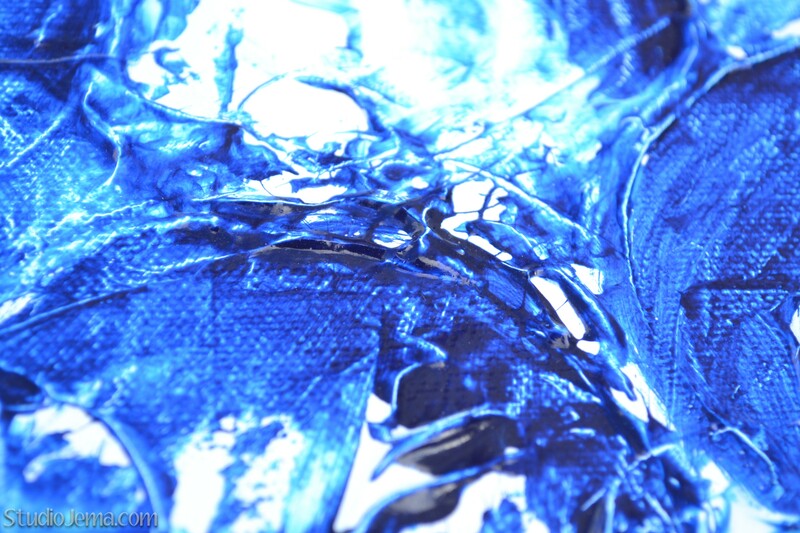 I brushed on layers of white paint, then used blue to accentuate the round curves of the gel. In celebration of living in the moment, to bring color where there is grayness for those of you still stuck in snowbanks, and because my readers rock, I am giving away this original acrylic painting. 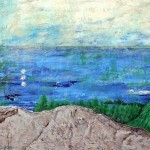 This lively painting is textured, ready to hang, signed and numbered on the back ($150 value). 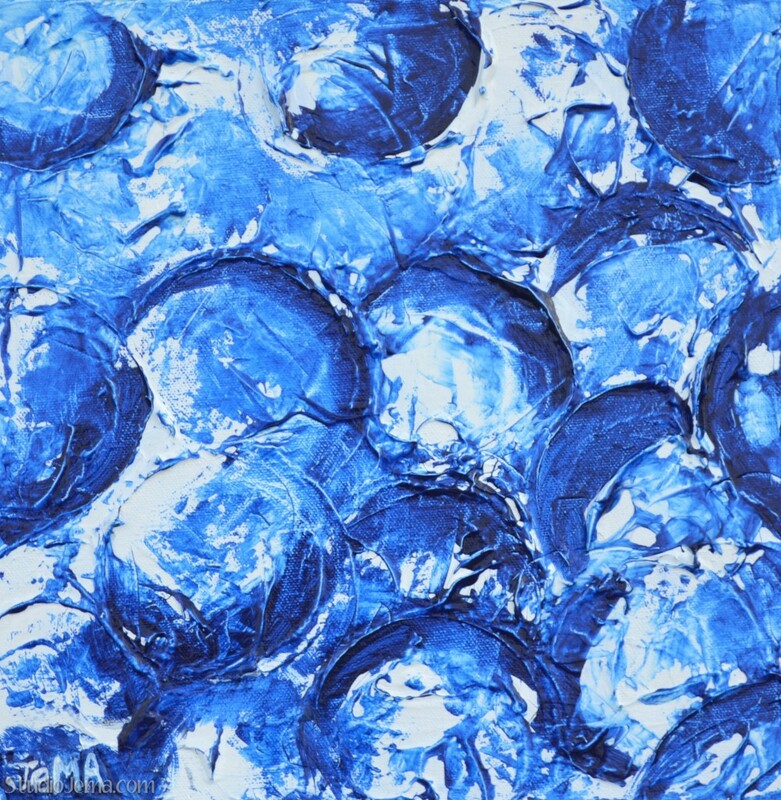 Enter to win this bubbly painting in the Rafflecopter Giveaway Box below which will choose the winner at random (see terms and conditions). Leave a comment on this blog post answering this question: Beyond listing family members, friends, or God, where do you find inspiration in life? The winner will be announced on Monday, March 31st on this blog post and on my Facebook page! Details to claim your prize will follow (if prize remains unclaimed for more than a week past the winner being announced, a new winner will be selected). Let’s have some fun! I find inspiration in strangers who have done great things with their lives. People who may have risked their reputation, financial security, or comfort to do something radical with their life. Whether it be outwardly radical, or something inwardly radical like breaking a negative or harmful family trait that has been passed down through generations. I find inspiration all over in nature. The way it can be so predictable yet surprising and unique all at the same time. Being in nature makes me feel inspired by relaxing and motivating me. One other thing that I find a lot of inspiration from is the passions and dreams of others. I enjoy talking with others about what they are passionate about along with helping them reach their goals if possible. I would like to learn more about photography because I absolutely love taking photos of various things in nature as well as capturing the candid emotions of others. I find inspiration in things I read and people I meet. Sometimes I read a blog article or have a conversation and feel I am truly changed by what I read or hear. I hope someday I can write something that changes the way another person feels. I find great inspiration in Nature and also in words, particularly quotes. Lyrics of songs too. They have the power to bring me to tears or fire me up with a single sentence! I find inspiration in vulnerability. Whether it’s told through a documentary, a person’s story or memoir, or just by an encounter with someone I love; it always inspires me to live honestly and show my imperfect side. Beautiful painting! I find inspiration in nature, reading, pondering the universe (yes I’m weird 🙂 ), and feeling strong emotions and working them out. I find inspiration in nature. Just the other day, I was driving to work and feeling down. About 2 minutes into my drive, the most amazing sunrise started. It began with pink and blue, then grew with yellow and orange. My entire morning commute is driving east, so I watched the colors change for 20 minutes.How could I not feel inspired after experiencing so much beauty in a simple sunrise? 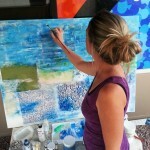 I find inspiration in nature, quotes, and in people’s vulnerability and authenticity when talking about their journey. Beautiful work!!! I love seeing where God has taken you on your journey since college. My inspiration flows freely when surrounded by the love and acceptance of true friends. The warmth of their company gives me the courage to truly be me and coaxes my creativity to surface, like sap rising in the spring. 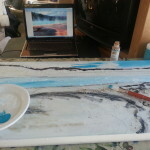 to seeing the layers and possibilities I’d have hurried past otherwise. I love your bubbles….they speak! My inspiration comes from those God places in my life. Some are here for longer than others, yet their impact is just as deep if not deeper. The knowing exchange of eye contact when I run across another special needs mom having one of those moments. The beauty in the smile of a cooing baby. The angst I feel with the unresponsive mother of the small, crying boy in the shopping cart at the checkout counter. The gems of life I find when reading about those who have gone before me and paved the way. The feeling of joy when I find my children working in harmony. The confidence that comes with the completion of a task that I never in a million years would have imagined myself doing. God blessed us with 3 very unique, quirky children each with their own set of (what seems unfair) challenges in this world, but the challenges make them who they are… they inspire me to be every bit the mom God has called me to be… they inspire me to grow beyond my comfort zone. I cherish the treasured people God brings into my life at the very moment it feels like it is falling apart and they restore me to a place of confidence in who I am… they inspire me to be real, to be me, to embrace the craziness of my life and just keep breathing. I am inspired those who live their purpose out loud with unconditional love for the world around them. I pray that God would one day use my life to inspire another. I mainly get inspired from things that are arround me and in the same time touches me in a certain way. For example a bird singing in the early peaceful morning, a happy and smiling person that passes me in the supermarket, music from somewhere who cheers me up and makes me move my hips. That all and more draws pictures in my mind and let me be creativ. Crazy, no? But I love it and it inspires me enormous. That’s easy. Children and the elderly. The innocence of children and the wisdom of the elderly always provide a means to a different outlook. Music, primal dance, assisting others on their healing path, singing, travel, new people and experiences…nature, of course. Jai…YOU WON! Congrats!!!! Sending you an email. Thanks to everyone who participated, don’t worry there is another giveaway coming soon!